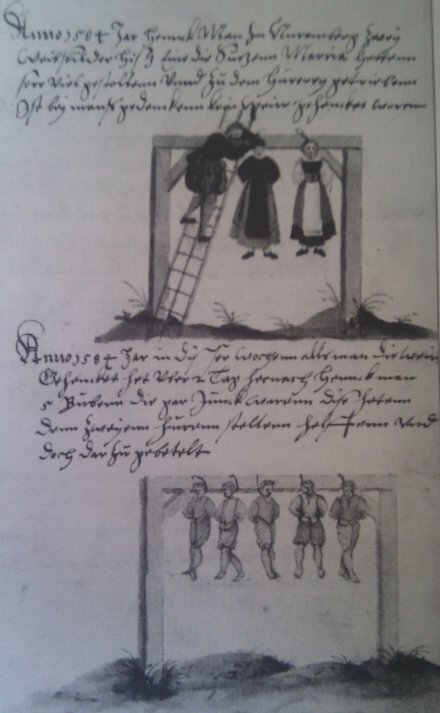 Executioner Franz Schmidt records in his journal for this date in 1584 the hanging of two women — according to Schmidt, the first women hanged in Nuremberg. February 11th. Maria Kurschnerin of Nuremberg, alias Silly Mary, who had formerly been whipped out of town with rods, and had her ears cropped; also Katherine Schwertzin of Weher, alias Country Kate, who had also formerly been whipped out of the town; both of them thieves and whores, who with thievish youths and fellows climbed and broke into citizens’ houses and stole a mighty quantity of things; both hanged at Nuremberg. It was an unheard of thing for a woman to be hanged in Nuremberg, and it had never yet happened. Thought Schmidt doesn’t say it, both of these girls were very young — according to Joel Harrington’s The Faithful Executioner, both would be minors by today’s standards. This helps account for the huge crowd that turned out to see them executed — many of them no doubt had also been in the huge crowd that had previously seen “Silly Mary” suffer a non-fatal corporal punishment the year before. The executioner Schmidt administered that punishment as well, and likewise noted it in his diary on January 10, 1583. January 10th. Mary Kurssnerin, a young prostitute, who was a watchman’s [musketeer’s?] daughter, a girl who had thieved considerably and a handsome young creature with whom the young Dietherr had dealings; Elizabeth Gutlerin, a bath attendant; Katherine Aynerin, alias die Gescheydin, a blacksmith’s wife and a handsome creature; all three children of citizens, and prostitutes, were here pilloried and afterwards flogged out of the town. Such a dreadful crowd ran out to see this that several people were crushed to death under the Frauenthor. Subsequently Mary’s ears were cut off, and she was hanged.